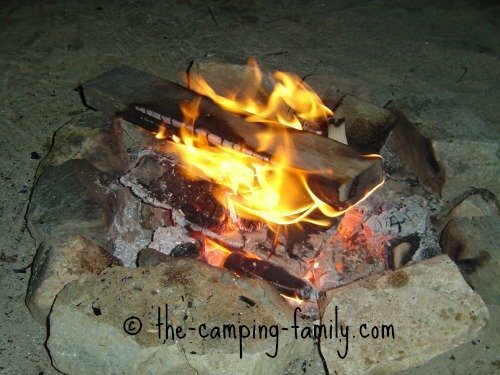 Camp Fire Cooking: Easy When You Know How! Camp fire cooking is a rewarding part of a family camping trip. There's something about gathering firewood, building a fire with your own hands, and then cooking your meal over it that appeals to the pioneer in all of us! Place your food on a grill directly over the flames. This is a great way to cook burgers, hot dogs and smokies. Heat up a can of stew by putting it in a pot and placing the pot directly in the coals or on the grill. A Dutch oven is a cast iron pot, perfect for slow cooking in a campfire. Read more about Dutch oven cooking here. 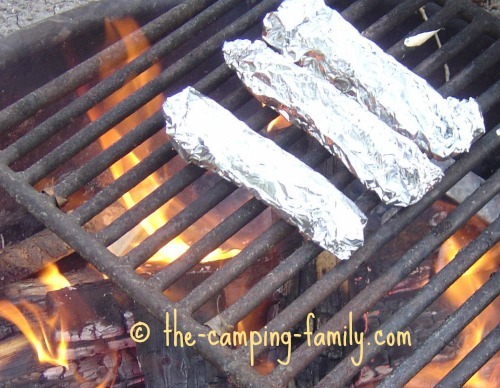 Wrap your meal in foil and place it directly in the coals. Then sit back and wait for supper! Everything you need to know about making tin foil dinners is here. This is the traditional camping method of choice when you are cooking hot dogs or marshmallows. If you need a refresher course on making roasted marshmallows, click here. For most of these methods you'll need a bed of hot, glowing coals. 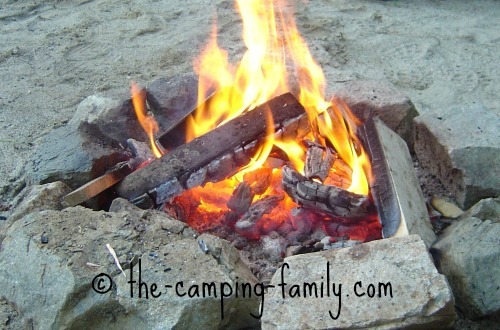 How to make a fire and create perfect coals for cooking. Get started at least an hour before you want to begin cooking. You don't need a massive inferno. A small, well-tended fire will create good hot coals - and use less wood. Keep adding firewood until the fire is very hot. Once the fire is hot and is burning well, leave it alone until it has burned down to coals. Move the coals to one side of the fire ring. This is where you'll place your food. Add more wood to the other side of the fire ring. This will ensure a supply of new coals. Keep tending the flames and moving the new coals as needed to replenish your coal bed. Once your coals are ready, you can begin cooking. 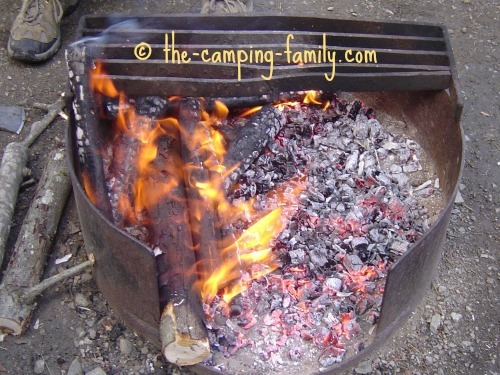 For more complete instructions about each method of campfire cooking, visit this page. Having the right campfire tools makes campfire cooking a breeze. 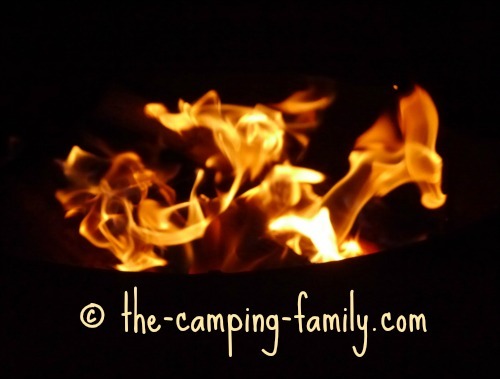 Click here to see the campfire cooking equipment we use. 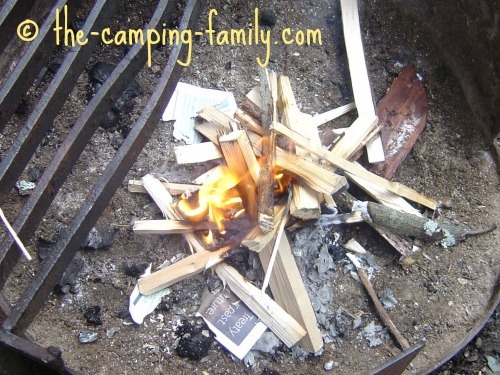 Have fun building campfire memories with your family! 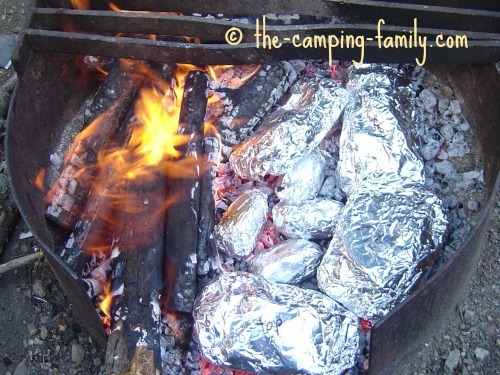 Now that you know all about camp fire cooking, click here for lots more great camping food ideas. Looking for more camping information? 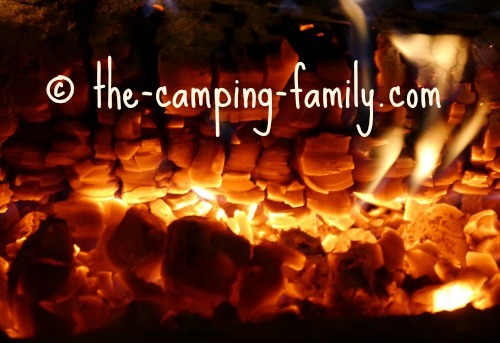 Click here for The Camping Family home page.